This site lists some of the more interesting podcasts I've found. With few exceptions, the podcasts found on various aggregators are childish, foolish, or otherwise a waste of my time. Even the top-rated podcasts are hit-or-miss. 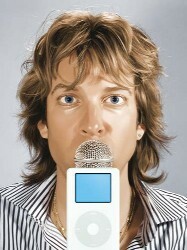 The reliability of information found on Wikipedia is brought into question again with the current episode of former MTV host Adam Curry allegedly making repeated edits of the podcast pages (from the same IP address) to enhance his own reputation as a pioneer of podcasting (which he is), and denigrate others claiming credit for achievements in the field--primarily Dave Winer. Curry and Winer have a long-standing feud over credit for the creation of podcasting. Information which can be so easily manipulated --and distorted-- for personal gain and aggrandizement surely must be held suspect unless and until confirmed by other sources. On my patch of the North Coast AM radio reception is bad. There is only one station with sufficient power to reach areas outside the city where it is located. Alas, this station is owned by Clear Channel Communications a right wing near monopoly which owns over 1,200 radio and some TV stations. They also produce many of the wingnut programs they force their stations to air. WHAM, my local station provides 24/7 wingnuttery from Glenn Beck--the fellow who recently called victims of Hurricane Katrina 'scumbags', to a local talk show host who was fired once for calling the mayor, an African American, an orangutan, Limbaugh, Dr. Laura, Michael Savage, Sean Hannity. The program director, when approached about opening up the chock-a-block right wing emphasis by hiring a progressive, or even moderate, personality, ridiculed the suggestion and gleefully expressed joy at being able to piss off a liberal. Clear Channel also gets a lot of criticism from the FM listeners over their heavy-handed control of play lists. Clear Channel banned stations from playing music by the Dixie Chicks because of their public criticism of President Bush's invasion of Iraq. September 16 may be the first day of many in which the ideological (rightwing) control of the people's airwaves is protested. Here and here. I'm shocked, shocked! my favorite and often used movie quote (Casablanca) failed to make AFI's Top 100 Movie Quotes list. Shocked, I say! 1. "Frankly, my dear, I don't give a damn," "Gone With the Wind," 1939. 4. "Toto, I've got a feeling we're not in Kansas anymore," "The Wizard of Oz," 1939. 8. "May the Force be with you," "Star Wars," 1977. Kenneth Tomlinson, the Republican chairman of the Corporation for Public Broadcasting (CPB) -- the government-funded organization that was designed to shield PBS from political pressure -- is aggressively pressing PBS to correct what he considers "liberal bias." This top-down partisan meddling goes against the very nature of PBS and the local stations we trust. Let the people speak and decide the future of PBS, not secret dealings by White House operatives. 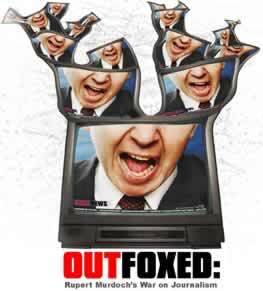 I've just watched the documentary Outfoxed:Rupert Murdoch's War on Journalism by Robert Greenwald. It is a superb film, worthy of attention by anyone concerned about the deterioration of public discourse in America and the effects of corporate media consolidation. Despite the right-wingnut whining about THE LIBERAL MEDIA, no more egregious example of media bias could be found than Fox News. Every accusation wingnuttery lodges against the media, every delusional suspicion of bias they deplore can be found at Fox News, and this film documents them, one by one, step by step, day by day. Be sure to watch the bonus section's piece "Behind the Scenes at Outfoxed." It shows the way the film was made, using volunteers who audited Fox News 24/7 for months leading to a content analysis just short of pure rocket science. Then, to amuse yourself further watch this clip of Bill O'Rilleytrying to spin the damning conclusions of the film. You can see atrailer and read what the filmmakers have been up to here. If, like me, only one AM radio station comes in clearly at night, and if that station is owned by Bush's buddies and campaign contributors, Clear Channel Corporation -- which owns about 1,200 stations and produces much of its own rightwingnuttery programing--the chances are what you hear at night will be Michael Savage on a program called "Savage Nation." 1. You can expect the Bible to be declared a hate book if Kerry wins." 3. "You can expect a rampant increase in partial-birth abortion and the sale of baby body parts if Kerry wins." Students of the media will find no surprise in new polls showing viewers of TV news are misinformed and mistaken about America's involvement in Iraq. Previous studies have shown Fox News viewers were uniquely ill-informed about WMDs, al-Qaeda presence in Iraq and Iraqi involvement in 9/11. polled over 3,000 people; what they found was that the more people got their news from TV, the higher the frequency of their misperceptions. Out of all the news networks, of course, Fox News ranked highest among misinformed viewers. The lowest was PBS. plain nonsense, it's really beginning to wear me down. respect life--as evidenced by the 911 attacks. unions are terrorist organizations. He said so. assigned it to the tin-foil hat file. attention, or it's become so common as to seem normal. The role of the journalist is to comfort the afflicted and afflict the comfortable." Or, as NYU communications professor Jay Rosen puts it, What Are Journalists For? and devotes his book of the same title to arguing that the answer ought to be different from what it is today. Journalism, he says, should not simply report the news and move on to another story; rather, it should become "democracy's cultivator, as well as its chronicler. Hundreds of the BBC's 29,000 staffers took to the streets recently decrying the one-sidedness of the Hutton report's findings and the indignity of the BBC being forced to apologize to a government seen as Machiavellian in its control of the news media. British democracy, many BBC staffers said, had been diminished and was in danger of further erosion. Other journalists agreed, with members of the National Union of Journalists issuing this warning: "There is now a real risk to the independence of the BBC and a threat to the ability of its journalists to hold government and others to account." Traditional definitions of journalism seem to fail in light of advances in both technology and corporate ownership of media outlets. Listening, viewing and reading habits change along with other aspects of media culture. Newspapers and newsmagazines have sharply diminished audiences. What used to be called journalism is no longer apt in discussing what we have today. If the integrity of the BBC is called into question, as it has been in the Hutton report, where should news consumers go for accurate, unbiased information? Is there a such a source? Ought there be? Has there ever been?